Hi, I’m Eric Schwartz, aka Smooth-E, aka Suburban Homeboy and things are about to heat up here on my Social Media Referral Page. Consider yourself the flame thrower who will help me ignite the world. The good news is the hard part is done–I’m already on fire. In other words, I need you to help me SPREAD THE WORD about my musical comedy, rap parodies, comedy videos and my one-hour comedy special, “Surrender to the Blender.” It’s EASY because I’m a big, computer-slaving nerd who has done all the work for you. Your involvement makes a BIG difference. Let’s do this. FACEBOOK: First, LIKE my page, then frequently bombard my page with LIKES, SHARES, @MENTIONS and COMMENTS. Every little CLICK and interaction helps get the buzz about your favorite hip hop comedy nerd! Plus, I see and respond often to your activity because I am obsessed with it. You can write whatever you want, but I realize it’s common to draw a blank trying to describe something as monumental as me. So, here’s a guide. TWITTER: Characters count. 140 characters to count, specifically. Let’s squeeze all we can out of this chatty bird. YOUTUBE: Subscribe to my channel, then binge watch my collection of over 80 videos. Every LIKE, FAVORITE and COMMENT you leave helps my videos and channel become discovered by other viewers on the platform. In layman’s terms, it blows me UP!!! There are many funny comedians, but very few like Eric Schwartz. Also known as Smooth-­E, Eric electrifies audiences with his blend of stand-up comedy, music and video. Behind his geeky facade lies a multi-talented showman who delivers an hour of musical comedy, physical antics, multicultural satire, hilarious characters and riotous laughter. This ain’t the same boring jokes in front of a brick wall–this is total entertainment that only Eric Schwartz can bring. 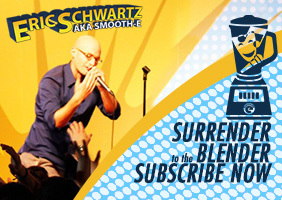 Audiences worldwide will follow Smooth-E’s mantra to SURRENDER TO THE BLENDER. Forbes.com applauds him for having “a minor industry in pop music parodies.” Laugh hysterically at the trailer for his “Surrender to the Blender” video, look for upcoming tour dates, or like his Facebook page at https://www.facebook.com/ericschwartz.